ASP's Slip Stream Transport (SST) line of trailers is super-aerodynamic, designed to ride in the slipstream of the tow vehicle to reduce the loss of fuel economy and offers air ride suspension for a tow so easy, you won't even know the trailer is behind you. The SST was originally created for the motorcycle tow behind market. "I loved taking long trips on the motorcycle, but hated not being able to carry all the gear I wanted to take," says Jim Kuzara, Founder, President, and Chief Designer of Adventure Sports Products, as well as a lifelong motorcycle rider. "I looked at other motorcycle pull behind trailers, but most of them were basically boxes on wheels with only a small amount of storage space." Jim wanted the trailer to be aerodynamic as well as roomy. "I thought a trailer should ride within the air disturbance already created by the motorcycle," Kuzara remembers. "By riding in the slipstream, the tow vehicle doesn't have to work any harder to maintain its speed." So the fuel economy of the vehicle isn't adversely affected by the trailer. Safety was another concern. Due primarily to an increase in big rig traffic, today's potholes average 6" in diameter. "If your trailer only has 9" tires, it's going to be potentially dangerous," warns Kuzara. So the SST sports nothing less than 12" tires. Of course, without the proper suspension, tire size is almost meaningless. In order to get the easiest tow, the suspension has to have enough give, or 'travel', to absorb the dips and bumps in the road. So Adventure Sports Products chose an air ride suspension system. According to Kuzara, unlike leaf spring and rubber torsion bars, the air ride suspension gives the best response. "Whether you're carrying 20 pounds of cargo or 200, it doesn't matter." Then there was the matter of looks. Motorcycle riders, as a group, are a lot like PT Cruiser owners in that they like to customize. So Adventure Sports Products designed the taillight configuration to match a variety of different motorcycles, including the Honda GoldWing 1500/1800, the BMW K1200LT, and Harley Davidson FLH series. Plus, they offer many extras including a chrome roof rack, tail wing, and an interior carpet kit as well as an 'Easy Stand' option that allows the SST to be stored upright, taking up no more room than a medium-sized refrigerator. Once the SST was perfected for the motorcycle market, the automotive applications were obvious. "Who else suffers from a lack of space?" Jim Kuzara recalls asking the Adventure Sports Products team. "The obvious answer was sports car enthusiasts." The first automotive version of the SST was for Chevrolet's Corvette. The SST - Corvette was an immediate success with Corvette lovers across the country. Since the introduction of the SST - Corvette, ASP has created SSTs for Ford's Mustang and Thunderbird, Pontiac's Solstice, Saturn's Sky, and now offers the SST - PT Cruiser. 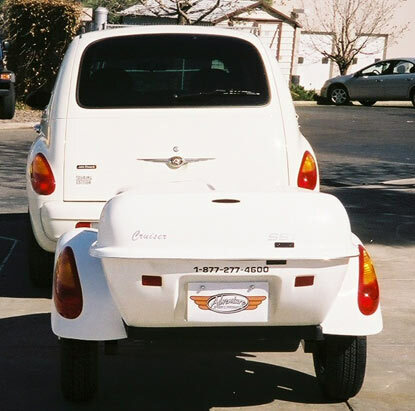 The SST - PT Cruiser incorporates the PT Cruiser taillights, while the hardtop shape is smooth, similar to the roofline. They even molded in an oval shaped LED third brake light into the hardtop. Like all the other SSTs, the SST - PT Cruiser offers the same aerodynamic design with 25 cubic feet of storage space and a spare tire trunk as well as the proprietary air ride system for a tow that is so easy, you won't even know the trailer is behind you! Adventure Sports Products is a privately held company located in Golden, CO., minutes from downtown Denver. In addition to the SST, ASP also builds larger cargo trailers and motorcycle hauling trailers that offer a 'one-person' loading/air lowering system and are designed to be pulled behind almost any car. Information is available about all ASP models on the web at www.adventuresportsproducts.com or by calling Adventure Sports Products at 303.403.4392.